...to see what money can buy. What ever happened to being satisfied with a home jersey and an away jersey? When are they going to add flashing LED's? I love the new helmet!! Not only does it look good, but it helped the local economy by having Hydro Graphics of Newburg design it. BTW RCP: you're much too young to be so grumpy about innovation and change. I know the recruits will love it! DoubleDipper wrote: BTW RCP: you're much too young to be so grumpy about innovation and change. I know the recruits will love it! *sigh* You're right. I guess I just don't like overindulgence, which is what this seems like to me. I like tradition. Oh wow, that's even cooler than the first pictures I saw. It's weird the O isn't on the side anymore but I love the wings. Hydro Graphics did Notre Dame's new helmets, too. I saw those last night and they looked stunning. It will all be for naught when Bucky lays down a whipping and the Badgers become Oregon State College Football Champs, much in the same way La Salle became Oregon State High School Football Champs. 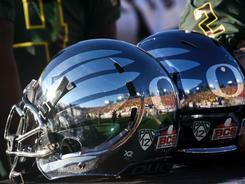 Apparently the Chrome helmets caused problems for the broadcasters. They couldn't read the player's numbers due to the glare. Oh well. They looked kinda weird on top of the dark green uniform, though. mattywizz wrote: It will all be for naught when Bucky lays down a whipping and the Badgers become Oregon State College Football Champs . . . Sorry about that, didn't work out for you. But as someone who has been a UO football fan for as long as a UP basketball fan (50+ years), it was a sweet victory. My father and my son enjoyed it in person, while I sat nervously on my couch. 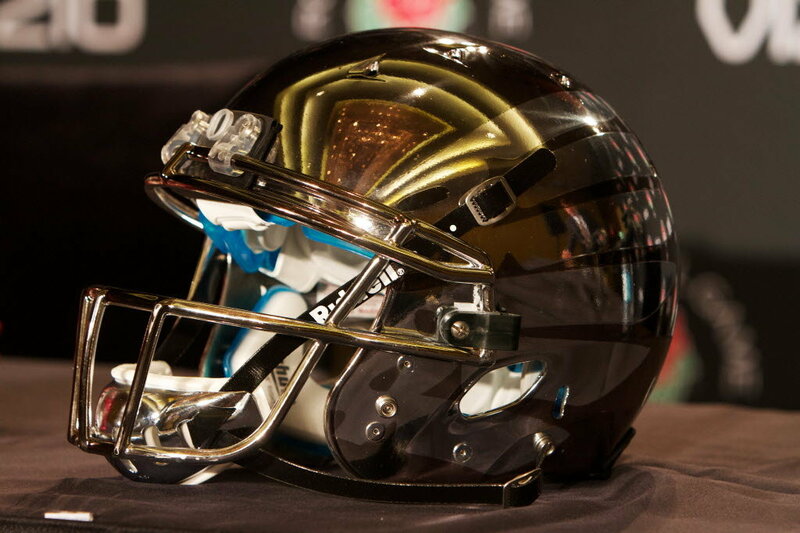 Those helmets are "sick!" After watching UO in the Rose Bowl, the Stanford and OK St. uniforms in the Fiesta Bowl seemed like "throwbacks. I love them; hope they come back next year on special occasions. PASADENA, Calif. — Coming off 94 years of bad luck in the Rose Bowl, Oregon’s scene-stealing fashionistas broke out mirrored helmets that threw off glints of light like sparklers, appropriate for the fireworks show that the Ducks and Wisconsin staged Monday. RCP, this is for you!